The MSM loves these false claims (the president didn’t disassociate himself from racists) because it feeds the liberal story line that President Trump’s base is made up of racists, white supremacists, neo-Nazis, and anti-Semites, They claim the reason Trump won’t rebuke them because he doesn’t want to alienate his base. The problem with that argument is that even before Charlottesville, during the election campaign President Trump constantly rebuked the haters–by name. The problem with that argument is that even before Charlottesville…during the election campaign President Trump constantly rebuked the haters–by name. Sean Hannity played a video Wednesday part of which gave examples of a pre-presidential Trump bashing the haters the media claims he never rebuked. 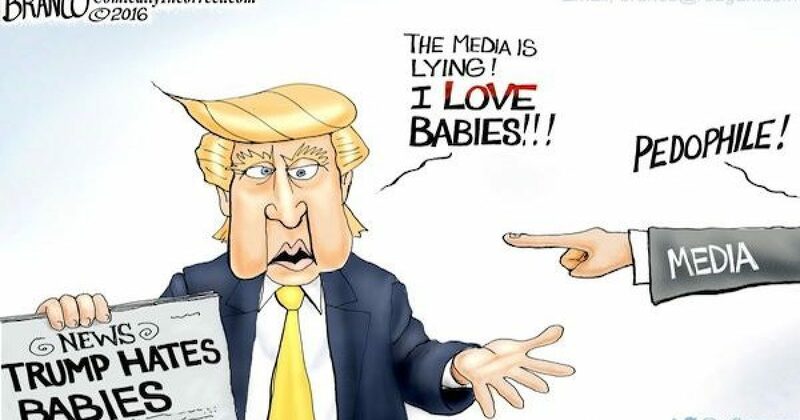 But that is only part of the MSM anti-Trump bias. Hillary Clinton also had some haters backing her. However, in Ms. Clinton’s case, the MSM never asked the Democratic Party standard-bearer to rebuke them, or even if she agreed with their hateful words (perhaps because she did). Not recognizing the rebukes of Trump and not asking about Hillary’s support from haters, if that’s not an example of the MSM’s anti-Trump bias I don’t know what is. A Lesson In MSM Anti-Trump Bias from Jeff Dunetz on Vimeo.